This year’s theme for World Malaria Day is “End Malaria for Good,” which underscores the opportunity that exists and the continued commitment that is needed to break the cycle of malaria and eliminate it once and for all. Expanded use of proven malaria control strategies worldwide, including distribution of long-lasting insecticidal nets (LLINs), rapid diagnostics tests (RDTs), indoor residual spraying (IRS), artemisinin-based combination therapies (ACTs), and intermittent preventive treatment in pregnancy (IPTp) by the Global Fund and the U.S. President’s Malaria Initiative, have significantly contributed to nearly halving the number of worldwide malaria-related deaths each year. From 2000–2015, these efforts are estimated to have saved up to 6.8 million lives, mostly among children under the age of five in Africa. Despite this tremendous set of achievements, approximately 3.2 billion people still remain at risk of malaria, and malaria causes more than 200 million illnesses and more than 400,000 deaths every year. The global risk of malaria results in approximately 1500 cases of malaria reported in the United States each year, among individuals returning from travel abroad. DPDM staff assist local health care providers to manage these cases, but the best way to reduce this risk among U.S. travelers is to make continued progress against malaria globally. Access to appropriate diagnostic testing and antimalarial drugs for children and pregnant women also remains poor in many parts of Africa, and concerns about insecticide and antimalarial drug resistance are more pressing than ever. There is a need to accelerate the progress and continue to fine-tune approaches to malaria control, to achieve global targets in WHO’s Global Technical Malaria Strategy 2016–2030. 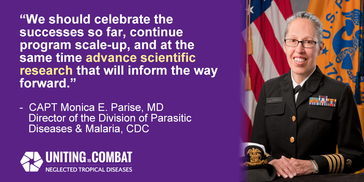 To learn more about World Malaria Day and what CDC and partners are doing, visit: https://www.cdc.gov/globalhealth/index.html. Have you heard of the London Declaration? In January 2012, the World Health Organization (WHO) released a report on “Accelerating Work to Overcome the Global Impact of Neglected Tropical Diseases,” (also known as the WHO Roadmap) which outlined a vision for the control, elimination, or eradication of a set of devastating infections known as the Neglected Tropical Diseases (NTDs) by 2020. In response, public and private sector partners including pharmaceutical companies, donors, affected countries, and non-governmental organizations, met in London and pledged to unite in their efforts to combat NTDs, marking their commitment with the London Declaration. Since then, there has been tremendous progress mapping the areas affected by these diseases, and providing needed treatments so that those areas have begun to shrink. 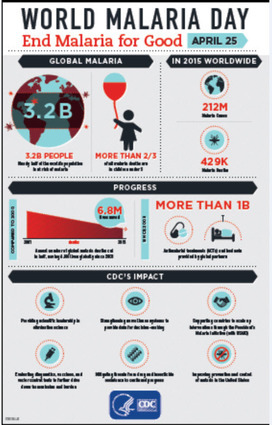 Trachoma, a NTD, is the leading infectious cause of blindness worldwide. To improve diagnostic testing and surveillance, DPDM staff are training public health counterparts in Ethiopia on how to use an innovative new laboratory test to detect infection. DPDM staff are also collaborating to compare this method to the more resource intensive eye exams currently used, as part of a larger project that evaluates antibody-based surveillance (to detect any resurgence of infection after MDA is stopped) in areas where trachoma was eliminated. 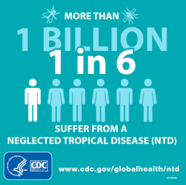 Learn more about trachoma and what CDC is doing about it and other NTDs here. With support from the U.S. President’s Malaria Initiative (PMI), Kenya began an Indoor Residual Spraying (IRS) campaign to help control malaria using a new insecticide called Actellic CS. Kenya recently switched to Actellic because of early signs that mosquitoes were becoming resistant to the previously used insecticide. Spray teams reached more than 200,000 structures, covering 95% of the targeted area. DPDM staff provided assistance to Kenya in monitoring the campaign and are helping to address spray progress, data and safety. 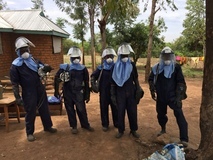 Entomologists from DPDM in Atlanta and from Western Kenya also traveled to Migori, a town in southwest Kenya, to oversee spray operations and to assess spray impact. Chagas disease is a preventable infection caused by the parasite Trypanosoma cruzi and spread by infected triatomine bugs known as “kissing bugs” or through blood transfusion, organ transplantation, or congenital transmission (mother-to-baby). Chagas disease affects 6–7 million people worldwide and an estimated 300,000 people in the United States. The initial infection usually does not cause severe symptoms and is often not even diagnosed. However, the effects of long-term infection can be very serious—some people develop abnormal heart rhythms, heart failure, and an increased risk of sudden death. April 14 marked International Chagas Day, an opportunity for organizations around the world to bring awareness to the disease and the burden it places on those affected by it. Did you know that pregnant women are at risk of serious complications from toxoplasmosis? Commemorating the 5th anniversary of the London Declaration.